Weggis is a municipality in central Switzerland, which is located right on the shores of Lake Lucerne and at the foot of the Queen of the Mountains, the Rigi. The inhabitants of Weggis often claim that their town is a little bit warmer than other places on the northern side of the Alps and they might just be right. Due to being protected from the harsh north wind, the climate is milder and there is hardly a garden in Weggis that doesn’t spread that little bit of vacation feeling with a palm tree or two. Even Mark Twain once described Weggis, where chestnut trees, grapes and figs flourish, as “the most charming place…” and compared it to the French Riviera. The town is strongly based in tourism and has many great hospitality and gastronomy options, but is also the starting point for a number of beautiful hikes around the Rigi. Many visitors choose to arrive aboard one of the old paddlewheel steamers and follow the trail of history through Weggis and beyond. One of them is the Mark Twain Trail, which commemorates the famous author and leads to Rigi Kulm. Another historic walk follows the side of the mountain to Küssnacht , leading through the Hohle Gasse, a historic alley that played an important part in Swiss mythology. According to the legend, it was in that spot, where Switzerland’s national hero William Tell shot Gessler, the evil Habsburg bailiff, with his crossbow. 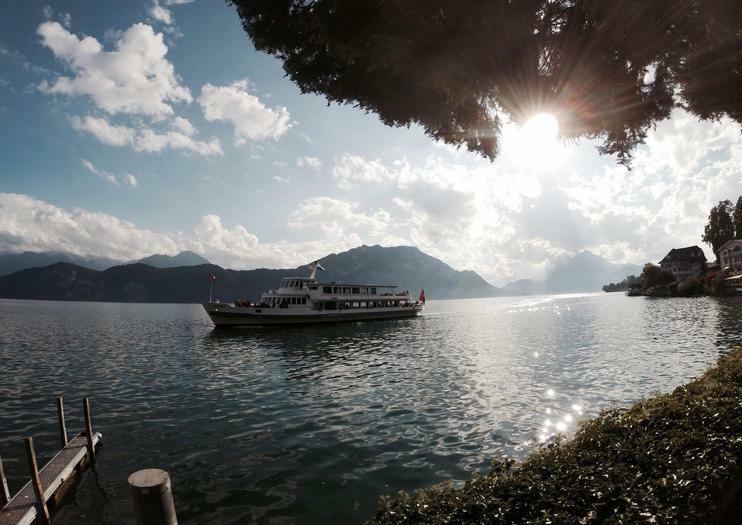 Weggis is regularly serviced by boats from Lucerne, a trip which takes about 45 minutes. This is definitely the easiest and most scenic way to get there. It is possible to arrive via car in roughly 30 minutes and there is also the bus number 2 with connections to Schwyz, Brunnen, Gersau, Vitznau and Küssnacht.